You know by now that I do a lot of woodturning, and one thing I do dislike is chips falling down the front of my shirt. A few years ago I made up a turning shirt by taking two old work uniform shirts and cutting the shoulder yolk and collar off one and attaching it to the front of the other. It looked like one of those old western movie shirts with the buttons down both sides and a clerical collar at the top. Worked like a champ, too. As I got more skilled at turning though, I felt like my attire was holding me back. Perhaps I could be a better artist if I were wearing a better turning outfit. So I bought the red turning smock from Highland and whether or not my work is better, I sure do look better when I’m working. Now I do have one bad habit when sanding finished bowls. I tend to hold the bowl against my body while sanding with the electric drill so that the dust goes down the dust collector hose. Unfortunately, I sanded a hole in my beautiful red turning smock. You’ve heard of chiseled abs; I have sanded abs. Well the answer to that sanding problem is one of the new leather aprons as found on the front cover of the new Highland Woodworking catalog. 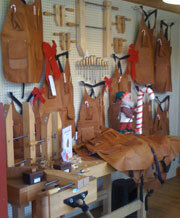 These leather aprons are beautiful! I went by the store today to look at them and I suppose I am just partial to leather, but when you walk in the front door of the store, there are at least 40 aprons on display all over the place. (You really need to come see the store at Christmas.) They are made of four basic pieces of leather stitched together with four pockets added to the front. The two larger lower pockets have riveted flaps over them to keep chips out and the other two are made for pencils, calculators and this time of the year, candy canes. The back of the apron is the naturally rough leather and the front is smooth and finished. I looked at a bunch of them before picking the one I wanted and the naturally occurring marks on the leather really add to the appeal. Some aprons are slightly thicker than others and have more marks, and some are lighter or darker in overall color and appearance. I was also very surprised when I picked one up and found how lightweight they actually are. This thing will not weigh you down. I bet if you call the store and ask them to pick out some particular feature for you, they will do it. With the light and strong flat straps across the back, and a quick snap connection, the whole thing is supported by your shoulders and still easy to get on and off. Beautiful! If by some very small chance you don’t want this one, you could get one of the others that Highland carries, such as the ballistic cloth turner’s apron, the leather turner’s apron, the belt apron, or a regular cloth apron. But the really good leather ones are what I think is best, and come on people, this is Christmas. Get the good one! My grandpa use to have one of these he loved it. I’m still working on getting it dirty. Got some paint on it the other day and that helped it some. I’m trying to get in the habit of wiping my hands on it when I glue or finish something.